program! The program begins June 1, 2019. * Registration is open for 2019. Step 1: Sign up for our "WORD with Zach" free summer reading program by June 1. Step 2: Download the summer reading calendar. Step 3: Read or listen to the Keys for Kids devotional every day and log the key phrase on your downloaded calendar. Step 4: Send in or upload your completed calendar each month, and receive a surprise prize from Keys for Kids! Complete all 3 months and you’ll be entered into a drawing for a Kindle Fire! Why Are We Running this Program? Kids need to read their devotional and more importantly their Bible! Not even 50% of American adults can name the four gospels, over 50% of graduating high school students think Sodom and Gomorrah were husband and wife, and 60% of Americans can’t name half of the Ten Commandments. 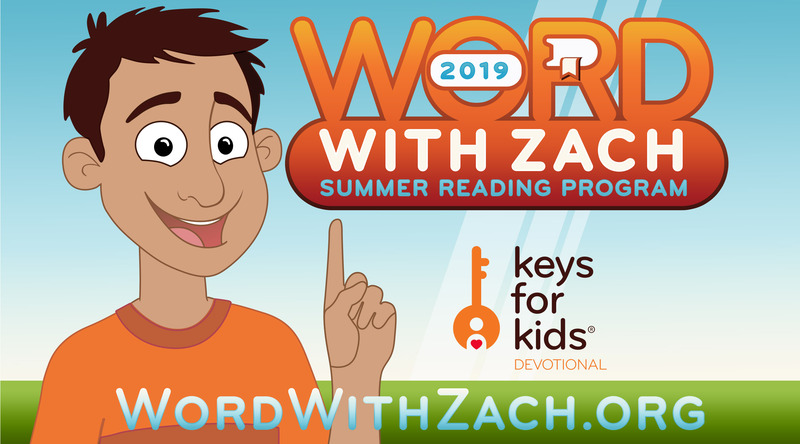 “WORD with Zach” is designed to encourage daily devotions and, more importantly, daily BIBLE reading that will help not only fight biblical illiteracy but help them have a passion for Christ through a deep relationship with Him. Keys for Kids devotionals are available for free on our free mobile app, daily email, or in print. Get Keys for Kids Today!